Sometimes a bowl of hot chilli is just what’s needed when the cold won’t stop and the Jetmasters are burning. Well if I had a Jetmaster it would be burning. Or a real fire. That’s the ultimate. 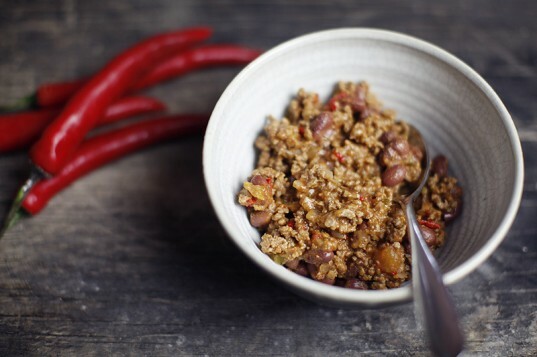 This chilli will get your insides warm whilst you find a heat source for your outsides. This recipe has been adapted from Bill Granger’s Chilli bean burritos with corn salsa (from Every Day) and a quick random scan of a few recipes online to meatify it. It freezes beautifully, so cook up big and have some tucked away for nights when you can’t do anything more energetic than open the freezer. This is a great feed-a-crowd dish – so you could easily just up the quantities. It’s served with a corn salsa which is a fresh, almost summery complement to the wintery chilli. (Note: there’s no photo of the salsa as I ate it all. Sorry…it was that good). I’d say the quantities outlined below would serve 4 adults, with some rice and the salsa. Or you could go tortillas or wraps. I’ve yet to find a commercial gluten free wrap or tortilla that tastes any good and actually bends instead of cracking. If anyone has any suggestions please let me know! Prep time – about 30 minutes. Cook time around an hour. 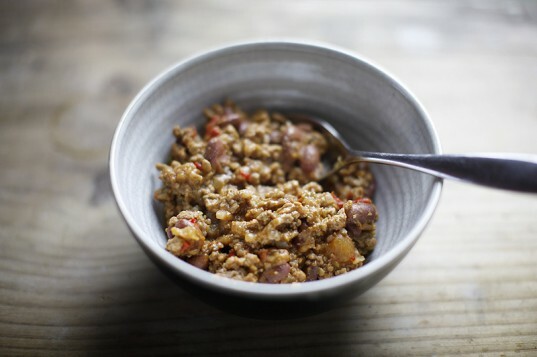 The chilli: get this going first, as it needs a bit of time on the stove to cook. Heat up the oil in a heavy based pan over medium heat. Cook the onion and celery for about 5 minutes, until they are soft. Then add in the garlic, chilli, spices and mince. Make sure you break up the mince well, otherwise it will cook like little worms. Cook until the mince is nicely brown, then add the tomatoes and stir it well. 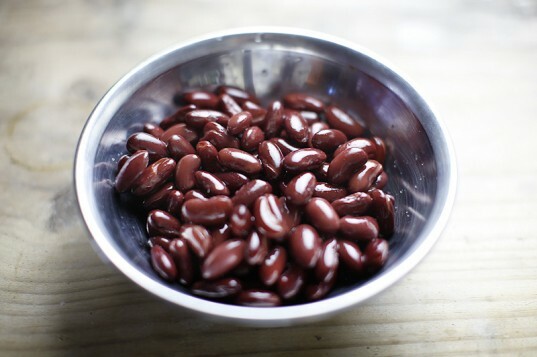 Add the kidney beans, and bring to the boil. Reduce the heat down low and simmer for up to an hour. Periodically stir and add little bits of the water – I probably ended up using a full cup of water as I had my chilli cooking for at least an hour. You want it to be nice and thick though, so don’t go nuts with the water. The corn salsa: boil or steam the corn until just cooked, then cut the kernels off. Let it cool a little, then tip the corn into a large bowl, and add the celery, spring onion, coriander, lime juice, chilli and remaining olive oil. Add salt and pepper to taste. Stir it all up. Serving: just before you’re ready to eat, add the lime juice and coriander to the chilli. Dish up the rice, put a decent, hearty helping of the chilli, some salsa and a blob of yoghurt if that’s your thing. Crack open a beer and pretend to be in front of an open fire with a day of skiing ahead of you. Speaking of firestarter I’m sure Prodigy ate lots of chilli before going on stage. 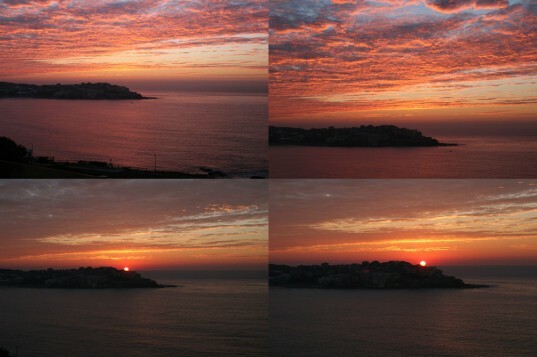 A Bondi firestarter sunrise from back in the distant days of summer…. Is this super hot Nessa? KT it’s as hot or mild as you like. 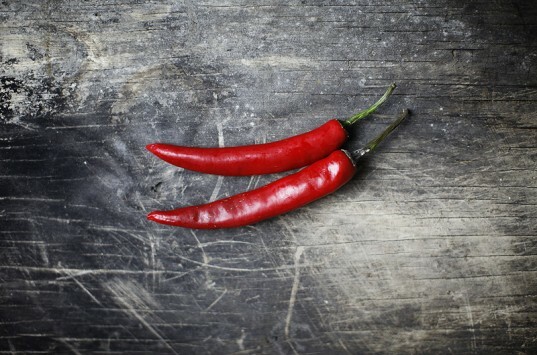 Taking the seeds out of the red chilli will reduce the heat factor. Or remove the chilli and cayenne pepper altogether if you want it really mild. I can’t wait to try it. Beautiful photo’s too.